Previously, we have covered about an updated version of Cydia to 1.1.23 that brought two new major updated features which were highly demanded by jailbreak users. Saurik has added a new discovery feature that shows users a list of categorized substrate based tweaks that aid in extending customization on stock iOS apps. 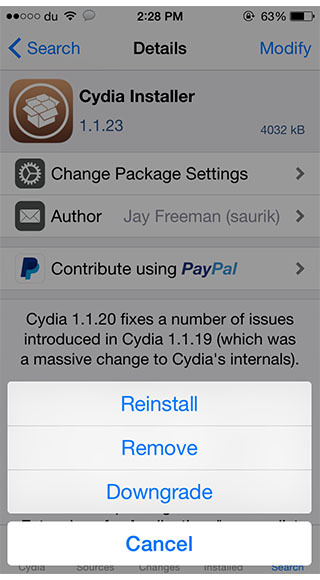 The ‘Find Extensions For Applications’ is a very useful utility feature which is part of Cydia 1.1.23 update. However, we’ll be talking about another feature that enables users to downgrade their jailbreak tweaks to the previous version or any version which is present in the repository. The reason this feature came up to our list is because sometimes when we upgrade tweaks, the newer version is a bit unstable and faces issues. This is where the downgrade feature in Cydia 1.1.23 is a viable option. 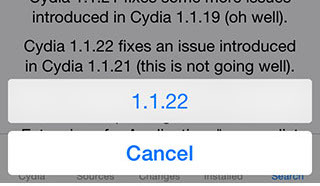 So if you haven’t updated your Cydia to 1.1.23 version, now is a good time. A step by step guide is provided for your assistance make sure you follow them in order. So we’re going to show you how it works. 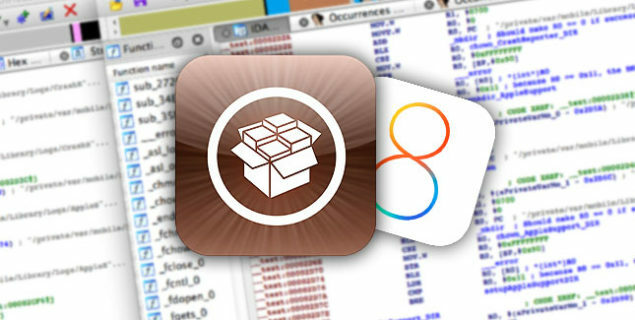 Begin by launching Cydia and open the package that you wish to be downgraded to your desired version (if its available). Now, you must tap the ‘Modify’ button located at the top right corner of the display. From a list of options that pop up, choose the downgrade one. Do take note that this option will only be part of the Modify options if the downgrade version is available. Else you will not see the option. If the tweak has downgrade-able versions in the repository, all of them will be displayed. Here is where you will select your desired version for a particular tweak. Select it. Tap confirm to start the downgrade process. Respring your iOS device once the downgrade process is complete. That’s that everyone, you have successfully downgraded a jailbreak package to a more stable version.There are some tweaks that updates to hinder the potential performance but finally having this feature in Cydia is a positive addition. That’s it for now folks. Let us know in the comments how important is this feature for you.